Travis Riggs gets around the edge. 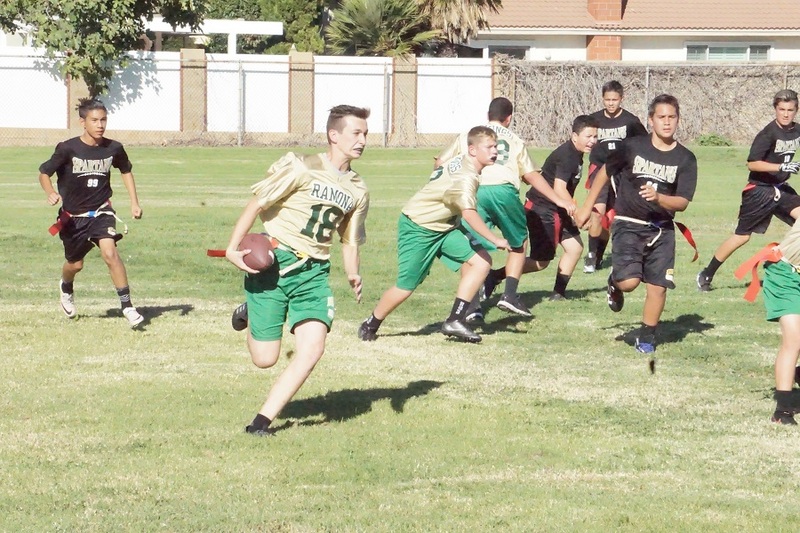 LA VERNE, California, October 24, 2017 — Bonita head football coach Ibis Aguilar just might have to drop in and pay a visit to the Ramona Vikings 8th grade football team that extended their undefeated season after defeating Glendora’s Sandburg Middle School 34-0 on the Vikings’ home field on a scorching Tuesday afternoon. It’s never too early to start recruiting. 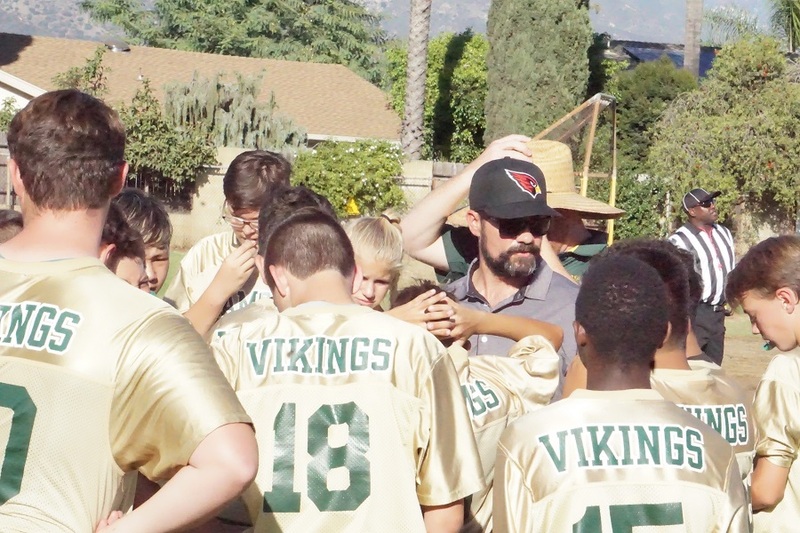 In fact, maybe the only thing hotter than the weather was the sizzling Vikings, led by head coach Adam Zeuli and his assistant Cory “the Counselor” Hanson. After catching the ball Caleb Burge put on his signature shake-and-bake move. Even more remarkable, the Ramona Vikings have surrendered only one touchdown all year, and on Tuesday, the players were their usually stingy selves on defense, blanking a solid Glendora squad. The Vikings went up 6-0 in the first quarter with Big Ed Shultz hauling in the first touchdown. In the second quarter, the Vikings doubled the score on a pick six by Chloe Medina who after intercepting the errant pass weaved her way through traffic to find paydirt. Seth Wrightstone made it 14-0 when he caught a pass for the successful two-point conversion. Chachi Perez was on the successful end of a long half-back option completion. 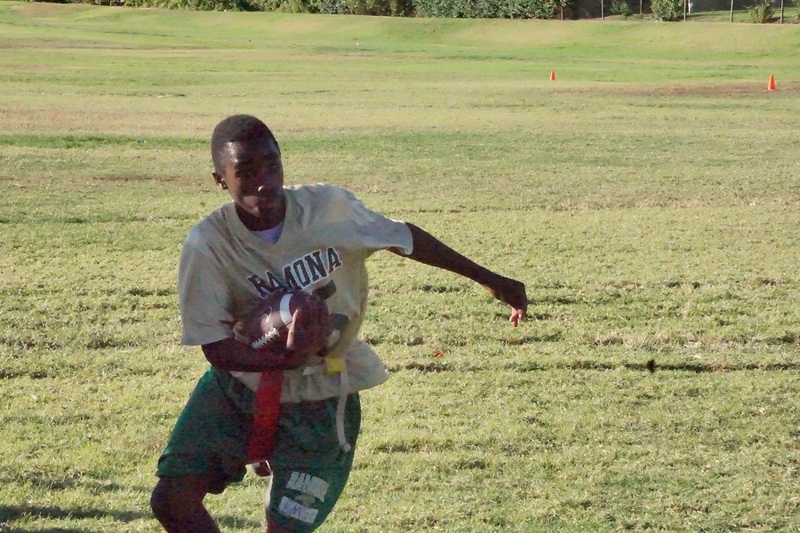 The vaunted defense struck again when Isaah Antunes Portillo picked off another wayward pass and ran it back for six points. 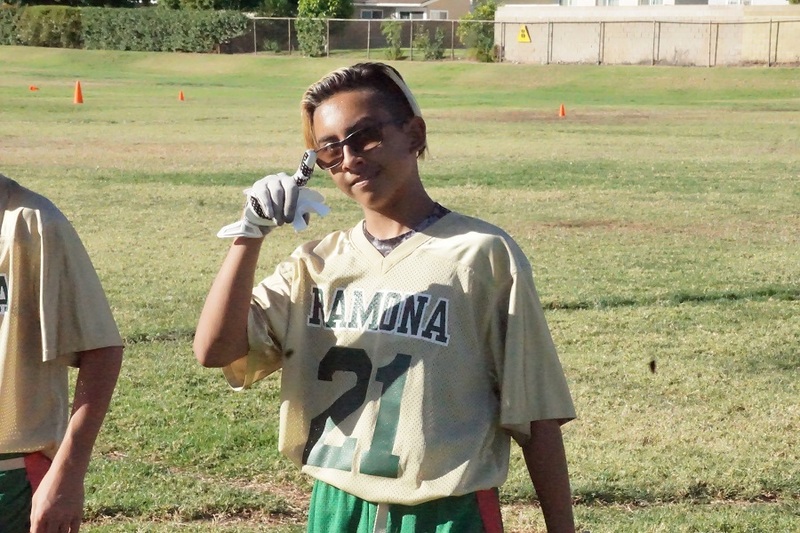 After the successful two-point conversion, Ramona led 22–0. 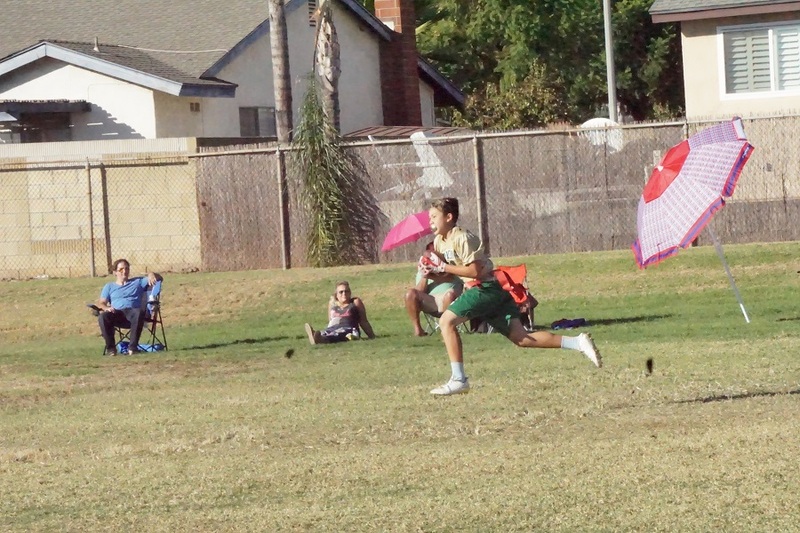 Given the score and Ramona’s suffocating defense, the outcome was a mere formality. Another highlight came late in the game when Chachi Perez made an over-the-shoulder catch of a half-back option pass for another six points. 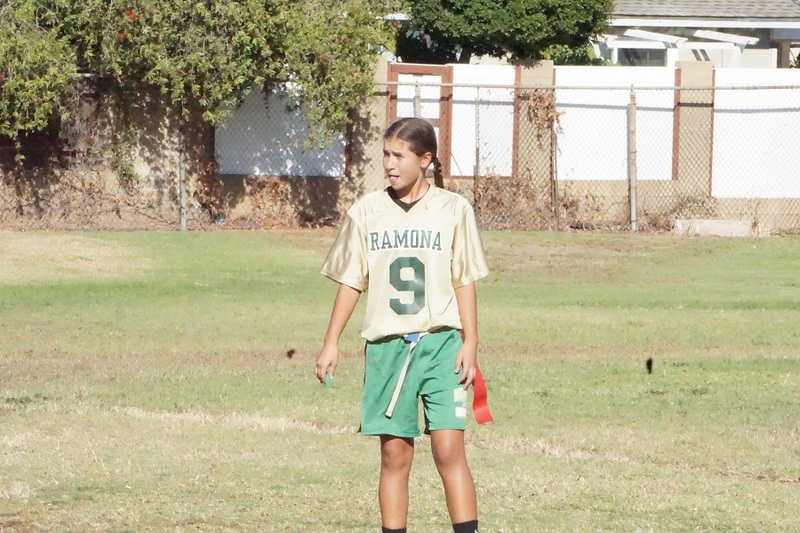 Chloe Medina was responsible for Ramona’s second touchdown. 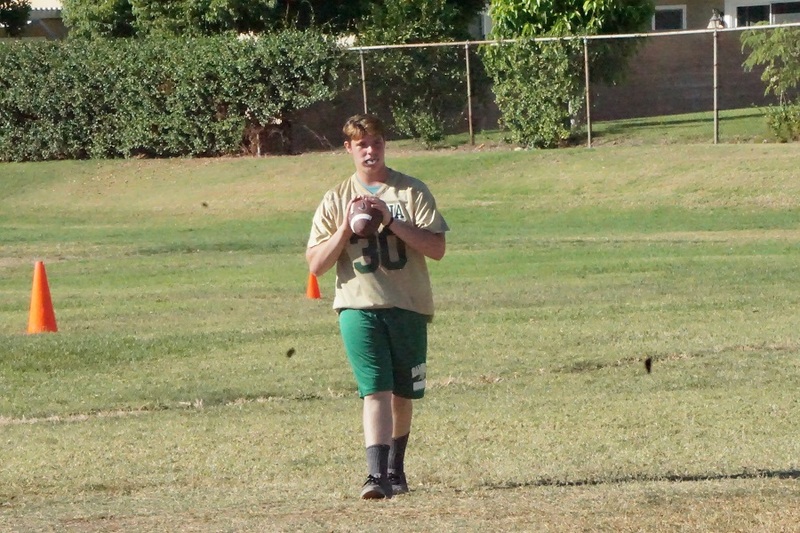 Other standout play came from right guard Tyler Randozzo, wide receiver Travis Riggs and running back Matthew Fidone. On the defensive side, Brian Kessler had a nose for the football all afternoon. From start to finish, Ramona dominated the gridiron, which should draw a huge smile across town from Bonita’s head coach. That’s because talent wins ballgames, and Ramona appears to have plenty of it on both sides of the ball in its perfect season. Running back Matthew Fidone proved an elusive target. 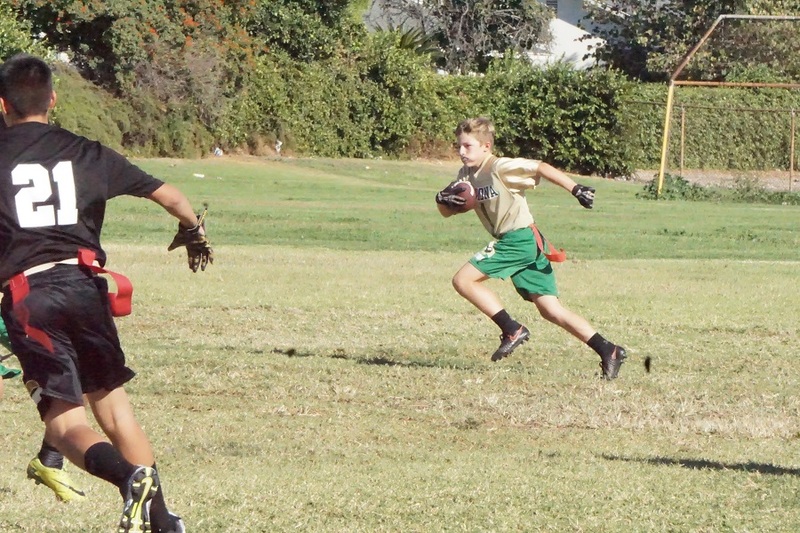 Isaah Antunes Portillo also ran back an interception for a touchdown. When Coach Adam Zeuli talks, he draws a crowd. Right guard Tyler Randozzo cleared plenty of holes for his backs to run through. Here he is in pre-game warm-ups.